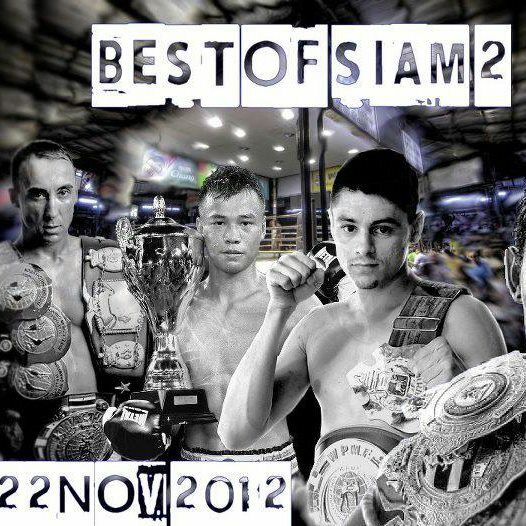 Best of Siam 2: Coming to Paris Soon! Damien Alamos seems to be moving from strength to strength with each fight. Damien Alamos has the rare distinction of not only being the very few farangs to fight and win the Lumpinee Stadium title, he successfully defended it a 2nd time against Aranchai Pran 26. And in my opinion Damien Alamos won in a very no doubts left fashion. He was scheduled to rematch Houcine Bennoui at Time 2 Fight in Tours, France on October 6, 2012 but the fight was cancelled in order for Alamos to face Diesellek Aoodonmuang at Lumpinee on October 12, 2012. This was a bit of revisit and reportedly their first encounter was a war. The second one resulted in a loss for Damien and will give him likely impetus to make his next fight a victorious one. Singkao or the White Lion as Damien is nicknamed will be kept busy by all appearances when he next returns to fight on the Best of Siam 2 card in Paris, France. The card will be brought to you by 2 legends of the sport in France’s own Jean Charles Skarbowsky and Krongsak Prakong Boranrat. Yes it is that Sanchai! Sanchai was and is widely regarded as the world best pound for pound fighter in Muay Thai. To say this is an incredibly anticipated matchup is an understatement. If this fight is half as good as it looks on paper it will be nothing short of epic and forever memorable. Also returning on the card will be a name not seen in a year in the international Muay Thai scene: Farid Villaume Vs. Antoine Pinto. Farid Villaume is known for his very Thai style of fighting and cut his teeth both in Thailand and internationally with a career of over 100 fights and over 80 KO victories. He will be returning to the ring at the age of 37 to fight Antoine Pinto also known as Antoine Siangboxing. Pinto has been fighting mostly out of Thailand but has also fought in Chinese promotion I-1. Pinto will enter the ring 16 years Villaume’s junior. Villaume brings a resume full of high level experience to the fight but is also bringing a year off of activity and a significant age difference. This could become an even more exciting card as it develops and matches are solidified but still for best of Siam’s sophomore try it’s hard to put a much more impressive card of international and Thai talent. ~ by fatsoking on October 12, 2012.